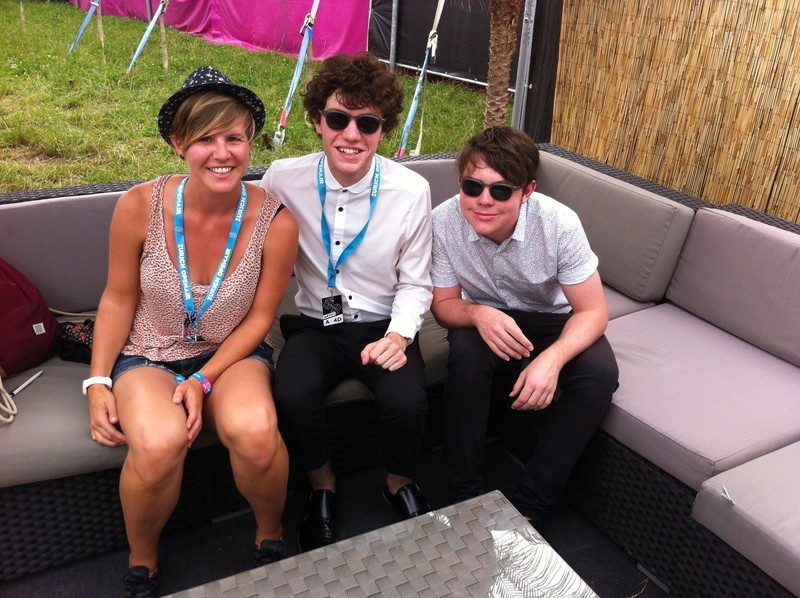 At Zurich Openair this Summer I met half of Californian indie pop/rock band Echosmith. I had a chat with two of the four young Sierota siblings: Noah (bass and backing vocals) and Graham (drums). They told me about their experience as a family band, their success and their living in the moment. Despite their young age they look very mature and so does their music. The Liberation: Your first album Talking Blings was released in October 2013 and the single “Cool Kids” became a hit. How do you feel about that and did you expect all this success? Noah Sierota: Yeah I mean a lot of it had been a major surprise, we put out a record and we put out some songs and they just took off on their own. We put them out and they kinda flew off and went around the world. It was really amazing to see how it was slowly growing. It’s for sure a slow growth and it’s stuck around. It’s amazing to see how our music is able to do that, I don’t get all the reasons why and how but we’re thankful for what happened. The Liberation: You’re signed to One Brothers Records, how did you end up there? Noah Sierota: I mean that happened at the end of 2011, you know a few years ago. And I mean we’d just met with some of the people there at the end of the year so everything happened in two or three weeks, it was really quick. We met with one of the heads of the NR and then with the president and then we basically got signed right after. It happened really quick we signed with the deal of two or three weeks after that. And so I mean it was exciting it kind of happened really quickly but it happened at the perfect timing. We started writing after that for a few months, working on the record. It was a great process and it really came together in a cool way. There’s almost such a sudden surprise but it worked out! The Liberation: Ok cool! Are you thinking about a new album already? Noah Sierota: No, I mean we’re thinking about it that’s for sure. But when it comes on how we worked on that, not very much. We’ve begun the process of writing but we haven’t really come together to bring our ideas. We’re kind on the state where we’re working on our ides separately and then eventually we’ ll bring all together at some points when we have time. The Liberation: Is it the just brainstorming kind of point? Noah Sierota: For sure for how we write it’s often someone comes in even with the smallest ideas and then we all kind of expand it and build it up all together. So we just have to get to that point, soon. We’ve talked about it we’ve kind of worked on some of these around on our own. For sure we’re gonna get that soon once the tour smoothes out a bit. The Liberation: Do you usually write the music or the lyrics first? Noah Sierota: You can start anyway. I mean you can start with the drums beat, with the bass line guitar thing or even words, or lyrics or melodies. You can start with anything and for us is like as long as it becomes a message of the band and the band all believes in it we’re all working on it together at some point there’s no rule to how it should be created and when it should be, as long as it’s us we’re happy. The Liberation: Yeah, ok. You’re original formation counts four siblings and your producer and tour manager, if I’m not mistaken, is your father. The Liberation: So it’s all a family business. How does it work? Is it good for you? Noah Sierota: Yeah. I mean we’re doing it still so it works, we’re alive and we’re doing well. Yeah I mean you meet certain difficulties at times when these things happen but you learn all through them. You know, it’s a family first then it’s also a band, a business. You work through it, you learn how to deal with things you kinda live in that sense for this live. You know we’re spoiled and we’re happy and we’re still touring we’re having such an amazing time. So just here we’ve been talking about how much fun we’ve had together playing these shows. The Liberation: And you’re all so young, I mean under 20s. How do you deal with the success? Noah Sierota: For us we try to be thankful for the moment we don’t hold too much on what was on the past and what will be in the future. We’re doing thins, we’re thankful for today, we’re in Switzerland we’re excited for that. But if we hold on too much to anything in the past or anything in the future then like if something doesn’t work out, or something fails or something ends we’d like be too sad. Right now we’re thankful for what we have, we’re working towards something and right now we’re very excited. The Liberation: Good! You grew up in a musical family, playing instruments and such. How did you decide to form a band? Noah Sierota: Yeah, I mean for us we all started playing instruments years before we ever played together. Then eventually we realised 8 or 9 years ago that we all played the perfect instrument to make a band. So why not? We did, we started playing together. The Liberation: Are any of your songs autobiographical? Noah Sierota: I mean I think all of them in a sense. The way we write is because all four of us write songs we write them all together. It’s like they can be more of a perspective of one person but we write them in a sense that they are for all of us. Even if one person started the songs, and the message is mainly about a message from a single person in the band. We try to make the whole message one in which the entire band believes in. The Liberation: Ok very good. What bands influence you the most? Noah Sierota: Cure, even bands like The Kooks you know who played yesterday and artists like that. Also different music, bands who have really great songs, like cool guitars and instruments. The Liberation: Ok very cool. Would you like to play a cover of any of the bands playing at Zürich Openair? Noah Sierota: A Kooks song would be fine. Noah Sierota: Or Rudimental is doing something, I think a DJ set maybe something about them. TV on the Radio I love their new record, it’s a really cool record, so maybe something from them. The Liberation: Cool! And are you gonna see any of the bands? Noah Sierota: Today we sadly have to fly out immediately after our show. We play, run to the van and drive to the airport as soon as possible. The Liberation: Yeah, cause I saw you’re playing Reading Festival in the UK tomorrow! Noah Sierota: Yeah, so we’ve got that, we’re really excited. The Liberation: Very busy! I’m done thank you very much! Noah and Graham Sierota: Perfect, thank you!